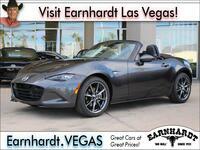 Amp up your day-to-day commute when you slide into the driver's seat of the iconic Mazda MX-5 Miata two-seat convertible at Earnhardt Mazda Las Vegas. With the debut of the refined 2019 Mazda MX-5 Miata, many car shoppers want to know – what are the differences? Take a closer look at the upgrades to the track-ready Mazda MX-5 Miata with this in-depth 2019 Mazda MX-5 Miata vs 2018 Mazda MX-5 Miata model year comparison. Drivers who have fallen in love with the Mazda convertible will have their choice of three track-ready grades – Sport, Club and Grand Touring – when you opt for the traditional soft-top Mazda MX-5 Miata. With an upgrade to the hard-top Mazda MX-5 Miata RF, you will have the chance to choose from two trim levels – Club and Grand Touring. 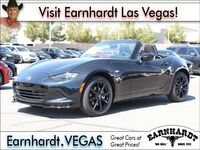 No matter which trim level or model year you choose, the Mazda MX-5 Miata promises plenty of thrills at Earnhardt Mazda Las Vegas! What Are the 2019 Mazda MX-5 Miata Engine and Performance Specs? Power and performance are the dual pillars of the Mazda MX-5 Miata design and the latest iteration will deliver on all counts in this 2019 Mazda MX-5 Miata vs 2018 Mazda MX-5 Miata comparison. Next-generation 2019 Mazda MX-5 Miata editions will feature a more powerful and efficient variant of the tried and true 2.0-liter SKYACTIV®-G four-cylinder engine that will manufacture 181 horsepower and 151 pound-feet of torque – 17 percent more powerful than the previous edition. Married to a six-speed SKYACTIV®-MT transmission or a six-speed SKYACTIV®-Drive automatic transmission, the Mazda MX-5 Miata will deliver elite performance. Safety gets an upgrade when you opt for the 2019 Mazda MX-5 Miata with a standard rearview camera and a smorgasbord of available high-tech safety features that include Traffic Sign Recognition, Smart City Brake Support and i-ACTIVSENSE® safety technology. In addition to added safety, the refined Mazda MX-5 Miata design will add an available brown convertible soft top, black 17-inch alloy wheels, a telescoping steering wheel, easy-open doors and a revised interior. An added highlight of the Mazda MX-5 Miata design is the standard 7-inch MAZDA CONNECT™ touchscreen infotainment system that will provide one-touch access to Bluetooth and multimedia applications. With an upgrade to the Mazda MX-5 Miata RF Gran Touring, you will enjoy 17-inch wheels, automatic headlights, heated leather seats, a nine-speaker BOSE® sound system, integrated navigation, Blind Spot Monitoring with Rear Cross-Traffic Alert, an Adaptive Front-Lighting System, High Beam Control and Lane-Departure Warning. Visit Earnhardt Mazda Las Vegas this fall to get behind the wheel of the 2019 Mazda MX-5 Miata!